A Motorola job listing that requires experience is no surprise, but the same cannot be said if that ad includes another "X" word, the X Phone, Google's rumored Motorola smartphone. Sure enough, someone from the company posted a LinkedIn ad looking for "Senior Director of Project Management, X Phone" candidates for its Sunnyvale, CA offices. 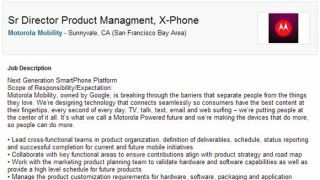 Google must have realized its mistake, as the job ad has been pulled and replaced with a simple message: "Sr Director Product Managment (sic), X-Phone at Motorola Mobility. The job you're looking for is no longer active." A similar job ad, minus the revealing X Phone title, is still available via Motorola's official careers website. The details of the LinkedIn version of the ad were captured by Phandroid. Sadly, compared to the blunt X Phone job title, the description remained vague, offering no hard specs or release date. Be that as it may, this was the first, albeit unintended, admission from Google that the X Phone does exist. Previously, the codename for the Google-Motorola smartphone was only a rumor. Conjecture has the X Phone's specs debuting the Android 5.0 Key Lime Pie OS update, and sporting a virtually bezel-less edge-to-edge 5-inch display. With the Google I/O conference coming up in May, the mysterious X Phone could make an appearance along with Motorola's first tablet under Google, the X Tablet. In the meantime, TechRadar will keep its eyes open for more X Phone or even X Tablet listings, and maybe even a Google human resources job listing, just in case this unintended reveal happens again.